High blood pressure is fast becoming a global issue and with more than 25% of the population being diagnosed with this lifestyle disease it is no wonder it is adding to the strain on the healthcare system. High blood pressure leads to an increased risk of stroke and other cardiovascular issues (1), as a lifestyle condition there are several dietary factors that may be playing a role. 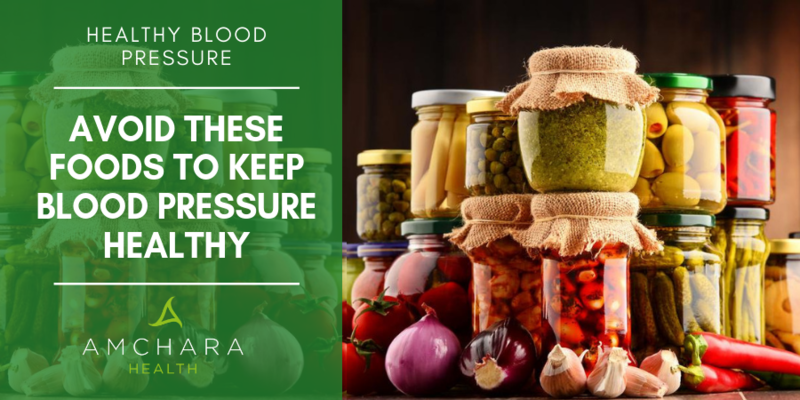 In this article we discuss which foods should be avoided due to their effects on blood pressure. There are many factors involved in blood pressure regulation and a lack of physical exercise, obesity (2) and stress (3) may all cause an increase in blood pressure. The type of foods and nutrients that you eat may also have a profound impact on blood pressure. Blood pressure is defined as the pressure circulating blood puts on blood vessel walls. This is under the influence of minerals like sodium, potassium, magnesium and calcium. Imbalances in these minerals can upset the regulation of blood vessel contraction and relaxation or cause the body to retain too much water - increasing blood volume. Salt has high levels of sodium and is known to increase water retention - making the heart and arteries work harder. When blood vessels constrict (tighten up), blood flow is restricted and so it becomes harder for blood to circulate causing blood pressure to go up. Alcohol and caffeine are thought to affect hormones that cause blood vessels to constrict. Blood vessel walls are made of muscle tissue and when there is damage to the blood vessel walls, such as in high levels of inflammation, this can result in deposits of fats or minerals that cause obstruction and narrowing - leading to high blood pressure. Saturated fats (4), trans fats (5) and a diet high in sugar (6) are all thought to cause inflammation or damage to blood vessels. These are often laden with added salt, additives and saturated or trans fats. Be wary of many ready meals, tinned and fresh soup, pizza, margarines, yeasts extracts like marmite or vegemite, bakery products and packaged snack foods and crackers. Where possible home cooked food is best as you control exactly what goes into it. If you do choose to use sauces or ready made pastes for cooking, keep an eye out for salt levels on the label. Meats such as ham. bacon, salami, sausages, peperoni and other deli style meats contain surprisingly high levels of salt and saturated fats. Replace these with lean poultry or oily fish. Try to avoid replacing processed meats with cheese as you may be surprised to hear that two average slices of cheddar (around 30 grams) contains almost half a gram of salt. Salt intake should be kept to below 6 grams a day. During the frying process oils used are not only soaked up into the food, increasing fat content, but they also become damaged. This can contribute to inflammation and damage to cells. Fried foods and takeaways are often also high in salt content. Keep takeaways like fish and chips, curries or Chinese to a minimum. Try some new recipes at home, this can significantly improve the nutritional content. Try baking fish and making potato wedges. Salt has been used for centuries as a natural preservative due to its ability to draw moisture out. The lack of moisture inhibits the growth of organisms that cause spoilage of food. Despite the development and use of artificial preservatives, salting is still used. Be aware of some pickles, salt preserved cod and food in brine. You may wish to swap tuna in brine for tuna in spring water and be careful with olive consumption if stored in brine. A high sugar intake leads to weight gain, tooth decay, Type 2 diabetes and inflammation and it is also linked with high blood pressure. Sugar is responsible for many changes to blood vessels (6). Avoid adding sugar to food and drinks and stay away from natural sugar alternatives like coconut palm sugar, brown rice syrup, maple syrup and honey. Sugar sweetened drinks are also best avoided as they have a link with high blood pressure (7). Be aware of hidden sugars in foods and always read the label - you are best to actually look in the ingredients section rather than the nutritional analysis as this will tell you how much added sugar there is rather than naturally occurring sugars. Artificial sweeteners include aspartame, sucralose, acesulfame K and saccharin. They are thought to be better alternatives to sugar but there has been evidence to show that they are not as inactive as once thought. Artificial sweeteners have been linked to changes in appetite (8), weight gain and glucose and insulin response (9). Artificially sweetened drinks show a similar impact on blood pressure to drinks sweetened with sugar (10). If you feel the need for a sweet tasting drink, then try a cinnamon containing tea - such as a blend of spices or a vanilla chai. These have a natural sweet taste and the cinnamon can help curb sugar cravings. A high intake of alcohol over the long term may cause lasting effects on blood pressure - it is thought to increase inflammation and damage to blood vessels and to stimulate stress hormones (11). Avoiding alcohol entirely may be beneficial but studies also show blood pressure may be lowered by having less than the suggested 14 units a week (12). However, it is important to emphasise that research into potential health benefits of moderate alcohol consumption should not be taken as licence to drink in anything but occasional and small amounts. There is a big debate over whether caffeine containing drinks have an impact on blood pressure - some studies suggest it does whilst others show no link. Not all people respond to caffeine in the same way; some people who regularly consume caffeine containing drinks may not show an increase in blood pressure while others who do not usually drink tea or coffee may react with an increase in blood pressure (13). As the response seems to be very individual it is probably best to minimise or avoid caffeinated drinks and replace them with herbal teas, fresh water and coffee alternatives such as chicory root coffee. Be aware that it may not just be the caffeine in coffee and tea impacting blood pressure as decaffeinated coffee has also been shown to influence blood pressure (13). Making small changes to the types of food you eat can have significant benefits on blood pressure and reduce the risk of further health complications. Take it one step at a time, rather than trying to do it all at once. If you need guidance on other lifestyle factors that may be impacting your blood pressure an experienced practitioner can help to highlight these and develop a personalised plan of action. We strongly encourage people to share their thoughts and experiences and help others in a similar situation. If you have high blood pressure and have used food to improve it then please get in touch. Tell us what worked well for you?